Abby Clawson Low of Hi + Low finds the most amazing design in the world. Sometimes she posts simple everyday things like local business cards and gold letter stickers. She has an amazing eye for the special in the everyday and makes me gasp at how amazingly beautiful things can be out of context. Her blog is by far one of my ultimate favorites. 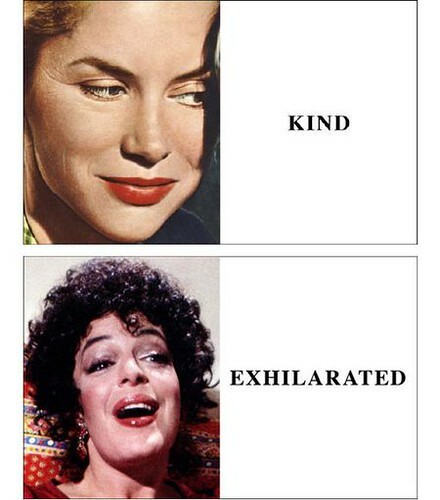 Just look at this series she recently posted by John Baldessari. Photographic images placed alongside adjectives such as “noble”, “kind”, “troubled”, or “jolly” — which establishes the various possibilities of image and language as two forms of communication. *. *I forgot to mention that Joanna of Cup of Jo fame recently posted my no t.v/romantic time V-day plan on her loooove blog at Glamour Smitten.